During the early morning hours on Friday, May 16, workers raised new, crisp golf flags in the holes around both courses of Grayhawk Golf Club. 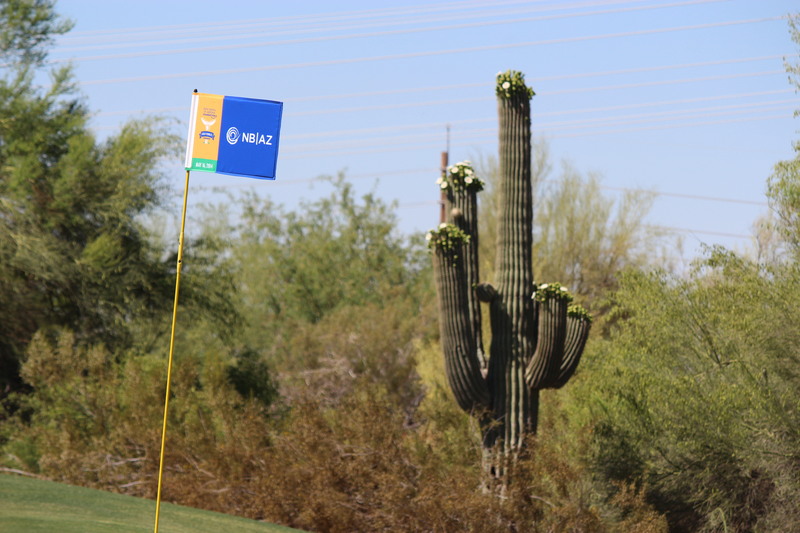 The flags carried the logos of the many companies that support the efforts of Delta Dental of Arizona Foundation. It was a beautiful, calm 77 degrees, the sun was just coming up and the grass looked lush and green. Unlike the calm fairways, the clubhouse was a beehive of activity as nearly 50 volunteers set up tables, organized auction baskets, placed signage, set up computers and put the final touches on the room that, in less than 1 hour, expected nearly 200 golfers who were anticipating a day of smiles and world-class golf. The day was perfect for the annual Golf4Smiles Tournament, which is the primary fundraising event to benefit the Foundation. In addition to raising funds, the event works fosters relationships and brings together vendors, dentists and community partners to support oral health programs around the state and have a great day of golf. During the event, the Foundation promotes its good works by distributing flyers, displaying photos of Foundation beneficiaries and grantees, and sharing a number of its successes during the luncheon program. These successes include the thousands of children who received dental screenings, fluoride varnish, sealants and exams due to the funds provided by the Foundation in 2013. In addition, a number of clinics throughout the state received much needed funds to continue providing services to families in need. Regional coalitions were funded to increase impact in their areas; educational programs were funded; dental supplies were donated. We are making a difference. This year’s event raised nearly $100,000, but the exciting news is that another 200 golfers and 50 volunteers learned about the good works of Delta Dental of Arizona Foundation – and there were smiles all around! Dr. Tim Wilson and staff of Affiliated Pediatric Dentistry and Orthodontics supporting the Golf4Smiles Tournament by donating items to the Coat/Blanket Drive to benefit AZMOM. Dr. Brien Harvey and his foursome pose for a picture during the tournament. Sparky and Howler entertained golfers during breakfast.